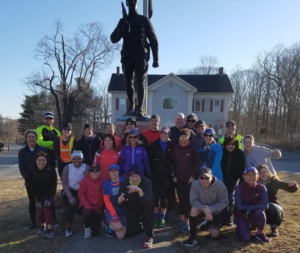 Last Week – The SLR took to the streets of Hopkinton and ran through Ashland, Framingham, Natick, Wellesley, and Newton to finish up at Boston College. 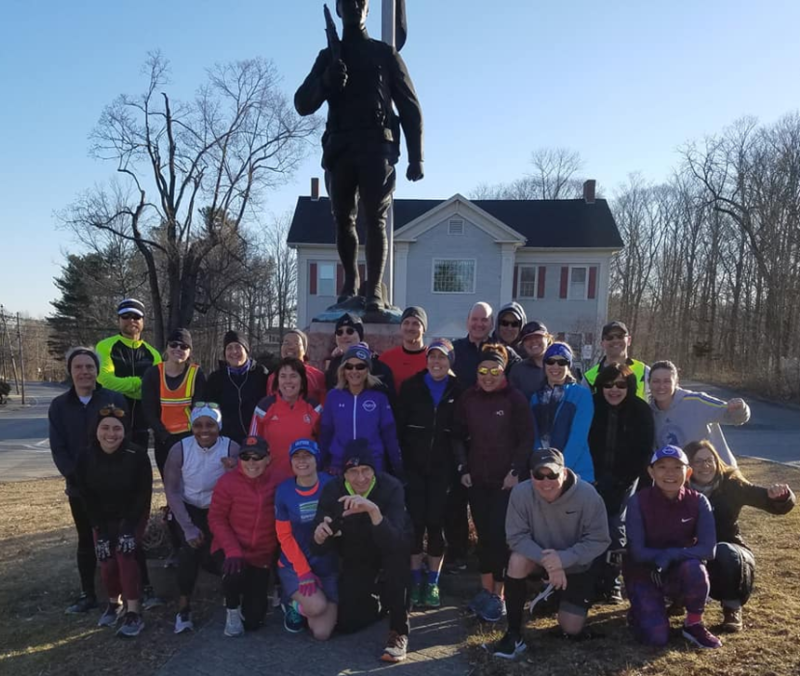 While we plan out every piece of the day on how to get about 30 people and 7 cars from Melrose to the starting line, on to Boston College, and back to Melrose, each year there are curveballs tossed into the mix to make things even more challenging. Thank you to Lois for taking command of the day and dealing with the logistics of executing the plan. Great Job! Thanks to Tom, Audrey, Hank, Liz, Sheree, Lee and Brian for being the drivers for the day. The task of getting people back and forth from the course is important, and the work done keeping the caravan moving along the route so there is food, water, and clothing in the right places at the right time is critical to making the run a success. Most of you have been doing this for several years and it is very much appreciated that we have an experienced team of dedicated people. Thank you! And to all the runners that signed up, read the instructions, followed the instructions, and made the day go as planned, thank you! I hope you enjoyed the unusually good weather and got some good training miles behind you as you head in to your halfs and marathons. And thanks to Mark the bartender and Lois the hostess for what appeared to be successful post run party. If you have any feedback on how to improve the big 22 miler, please feel free to send me an e-mail. This Week – For those running Boston it’s time to taper. The mileage goes down while the intensity remains steady, giving your body time to recover from the big run as you sustain your fitness level. We’ll be running Swains Pond and then the long runners will head out to Farm Street. Start 1 – The run will start across Main Street in front of the Y, and turn immediately left on to East Foster Street and up a hill to Melrose Common. Turn right on 6th Street at the Common Market, and follow that straight as it becomes Swains Pond Ave. Make your way to Swain’s Pond, turning right at the stop sign by the ponds. Follow Swains Pond Ave to the end where it intersects with Lebanon Street. Turn right on Lebanon, left at a set of lights on to Forest Street, and finish the first section at Citizens Bank in Malden at the corner of Main Street and Forest Street. Full 2 / Half Finish – Leave the water stop on Winter Street and pass the Oak Grove T stop into a 5 way intersection. Cross straight over to Glenwood Street. Follow that to Highland Ave where you’ll turn right and quickly turn right again on to the Fellsway East. Ride the hills of the Fellsway to Grimsby’s. If you’re running the half distance you’ll turn right on West Wyoming, left on Main, and finish at Brueggers for 7 miles. Long runners will continue straight past Grimsby’s on to the LynnFells Parkway to Melrose High School where they’ll hit the next water stop. Full 3 – Taking the LynnFells Parkway into Saugus, turn left at the lights at Main Street in Saugus, running along Main Street until it becomes Farm Street in Wakefield. Turn left on Nahant Street, which will take you over to Nick’s Pizza where there will be another water stop. Full Finish – Head south on Main Street, to Melrose, to Brueggers, and finish up your run. Water Stops – Lois and I have them covered. Anyone else who wants to help is welcome. This entry was posted on Saturday, March 30th, 2019 at 10:33 am and is filed under Uncategorized. You can follow any responses to this entry through the RSS 2.0 feed. You can leave a response, or trackback from your own site. In for the full plus maybe a loop of Breakheart (same for Rushton I believe). Don’t wait for just us/ me at Nick’s. In for the half Thanks! In for the half! Thank you! In for the Half, thank you! In for the full. Great job last week to everyone who ran and supported. I’m in for the half. Thanks. I am in for the half, plus a couple miles. Thank you! Freddi is in for the full. I’ll run what i can unless water stop help is needed. In for the full, thanks! I’m in for the half. Thanks! I’m in for the half plus a tad more (maybe)! Thanks SLR! Jess and I are in for the half plus some. In for the full!! Thanks so much!!! Welcome back Jim!!! You had unbelievable replacements but we missed you!!!! In for the half…thx Jim!